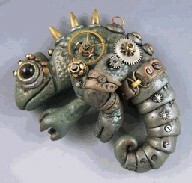 One of the rages sweeping the crafting world right now is Steampunk. What is steampunk, you ask? Think of it as Victorian science fiction, futuristic workings in the past, goggles, gears, clockworks! 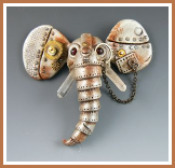 Renowned polymer artist Christi Friesen has truly embraced the steampunk style, and has even published a book about it, Steampunkery! Christi combines polymer clay, beads, gears and small found objects to create animals, hearts and other interesting treasures. Now, I hadn’t ever dabbled in the world of polymer clay before today. I scrapbook, knit, quilt and sew, but clay has always been a mystery to me. 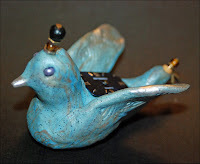 That is, until I watched Christi’s new video tutorial on making a polymer steampunk bird. Her friendly style and amusing explanations had me smiling from the start. She made rolling a ball of clay look so easy and fun (and her cake analogy made me hungry)! I had to try it! So, with a block of Sculpey, some beads, and bits and pieces of old watches, here’s what I came up with. Not bad for a rookie, huh? I have to say, following Christi’s step by step instructions made this little project both easy and fun. And a pasta machine to help soften the clay didn’t hurt either. Next up, I’m going to brave another creation from her book...maybe this elephant? I think I’m hooked on the steampunk craze too!